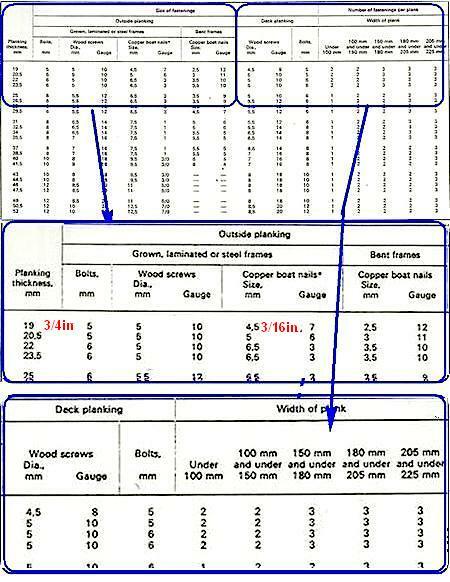 Wood Screws for Boat Building and Repair. Humble wood screws are the most widely used and versatile methods of not only joining wooden parts but also for attaching fittings. Slotted Countersunk which are the most commonly used screw for joining wood to wood. Slotted Round head which are ideal for attaching thin metal fitting to wood as they eliminate the need to countersink. Slotted Oval which are countersunk but have a slightly domed head these again are usually used to attach metal fitting to the wood. As well as the standard slotted wood screw there are several versions of the cross-head screw available. The cross head screw types were aimed mainly at power driving of large quantities such as on a production line. Unfortunately these require different specific types of screwdriver head. Using the incorrect size or type of driver will damage the screw and maybe even the work piece. And the other problem with them is, if you should want to remove them to carry out repairs, it will be almost impossible to clear any paint, varnish or putty from the ‘slot’. There are other types of wood screws such as those with double threads and those with the threads going all the way up to the heads. These however are primarily for use with composite boards which, have no place on a wooden boat. 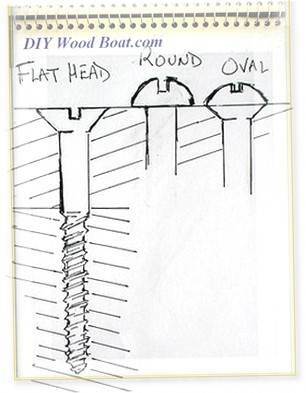 For the vast majority of wooden boat building work the counter sunk slotted head wood screw is the preferred option. In many instances the heads are going to be concealed below the woods surface covered either by wood bungs or putty. The general consensus of opinion among the experts is that silicon bronze is the metal of choice for boat building wood screws. The corrosion of metal fastenings is complicated by many factors. Different metals have differing reactions with various types of wood. The process is further complicated where there is any form of electricity. And seawater is regarded as a catalyst in electrolytic and galvanic corrosion. So everything considered silicon bronze is regarded as the best compromise but even then they should not be exposed to running water which, is why screw heads on wetted areas should be covered with bungs. If we were to go by galvanic corrosion figures then stainless 316 ‘passive’ and 314 ‘passive’ and Monel should be the fastening materials of choice. But what is the difference between ‘passive stainless’ and ‘active stainless’ and how can you tell? You can’t, as far as I know tell by looking at them. And Monel wood screws are expensive and not easily obtained. However stainless screws will be fine for small boats which don’t live in the water. And steel screws are probably an ideal option for fitting out and other above the water line, work. Except, for another of those complication caveats, stainless and oak I am reliably informed are not compatible, something to do with the zinc coating I believe. Galvanized fittings, of decent quality are increasingly difficult to find and are only worth considering on big boats with massive timbers. Brass used to be the most common metal for boat building wood screws until silicon bronze became comparable in price and availability. However, brass will corrode faster than silicon bronze and it is not as strong or hard so, more prone to wringing. Screws hold by exerting both tensile pull and lateral or sheer resistance. They can even be used to draw pieces together, something which a nail cannot do. However, it is best if the pieces to be joined are clamped together first. The withdrawal loads a screw can resist depend on the screw material, the gauge and the strength of the wood under the head. Withdrawal resistance from end grain will be up to a ¼ of that across the grain. Screws set too close to the edge will also have less effect. A common problem when inserting screws is wringing, usually at the top of threads, when being screwed home. This will be minimized by drilling the correct size of pilot hole. Lubricating the screw will also help. My old Dad swore by a bit of bar soap as a lubricant however, he was just putting up the odd shelf at home. On a boat, with all the complications with corrosion it is best not to use soap or grease in case of any chemical reaction. It is better to use something like red lead paint or white lead paste, these will also help protect against corrosion. Ordinary paint or varnish can be almost as effective. Wringing does seem to be less of a problem when using a power driver or a brace, possibly because of the continuous turning as opposed the stop start motion when hand screwing. For fastening planks to frames the rivet and rove is probably the better solution. Not only will the diameter of the rivet needed be less than that of a screw but copper nails and roves are cheaper. However, riveting is a two person job, it wont draw the plank to the frame, and is time consuming. The renowned boat builder Herreshoff built many superb craft using screws to fasten the planks and there are a number of examples still afloat. However, that was prompted by his method of upside down building which made screws an easier option. I would not however recommend using screws to fasten planks to steam bent frames. The steaming does weaken the internal structure of the wood reducing the woods ability to hold the screw. On steam bent frames use a through fastener such as a rivet and rove or nut and bolt. On a normal wood screw the threaded part is approximately 2/3 of its length. The top third is the un-threaded shank. To allow the timber to be pulled tight to the underlying surface a clearance hole to take the full length of the shank should be drilled. For hardwood the clearance hole should be exactly the shank size, for softwood it can be slightly less. Below the clearance hole the pilot hole for the threaded part should be approximately 90% of screw diameter for hardwoods and 70% for softwood. The pilot hole can stop just short of the full length of the screw to allow the point to bite. 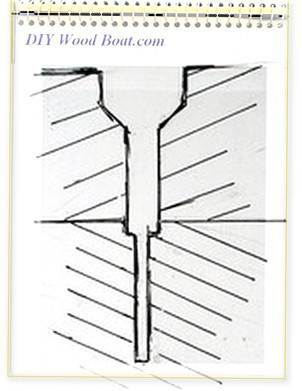 The ideal hole should be perpendicular to joint and not too close to the edge or the end. Ideally the shank should penetrate across the joint as this is where most stress occurs and where corrosion most likely, the thicker shank is better equipped to cope with this. However, compromise may be necessary if the screw proportions are not ideal for the wood sizes being used. Drilling a clearance hole with one bit, then a pilot hole with another then, counter sinking with a third can be a bit tedious. Fortunately there are several quite clever combination bits available which, will drill clearance holes, pilot holes and countersink all in one stroke. Some require different bits for different sizes of screw so are probably not cost effective unless you are drilling a large number of same sized holes. Tapered drills with a Fuller type counter sink which, fit on the drill bit are popular, however these are in effect reamers and the clearance hole should not really be tapered. I prefer to use an adjustable countersink and stop collar, with a lip and spur drill bit. Then a separate pilot drill. Each in one of my two hand drills. For the occasional small gauge wood screw into softwood, a gimlet or even a bradawl is sufficient to make a starter hole. And sometimes it might be easier to use a hand countersink, these are available with fitted handles for quick easy use without having to change drill bits. Counter bores with matching plug cutters can also be bought as set. Using pre-cut plugs is probably the easier option for most folk. However, cutting your own is not that difficult and if you have enough off cuts it will work out much cheaper. Is there a trick to removing silicon bronze wood screws? They always strip or the heads break off.